On February 1 the BSA announced "Version 2" of Youth Protection Training. All adult leaders must complete this new version of YPT before October 1, 2018. Some councils may require it to be completed sooner than that. This change applies to all BSA units, including Cub Scouts. To support this change, we added a Not Valid After field to the Training Course detail page in TroopWebHost and TroopWebHostCS, as shown below. We ran a script to set this field to 10/1/2018 for all existing instances of Youth Protection Training. That script also inserted a new Training Course to represent the new version of Youth Protection Training. If your system had the corresponding courses for Venturing and Exploring, we created new versions of those as well. This will allow you to begin tracking the completion of the new version of this course for your adult leaders, so you can be sure that everyone completes it by the deadline. If your council has set a different deadline for the completion of the new YPT training, please go to Site Configuration → Training Courses and update the Not Valid After value on all of your old Youth Protection courses. Urge the adult leaders in your troop to complete the new Youth Protection Training 2 class as soon as possible. 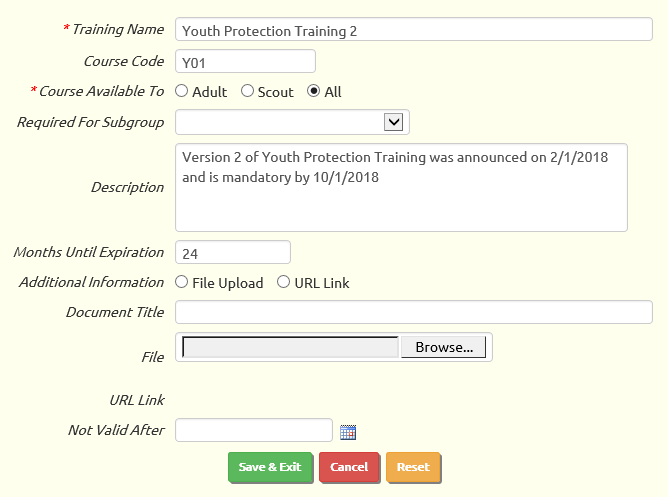 When leaders complete the new YPT-2 class, be sure to record it using the new "Youth Protection Training 2" course that we added to your system. We encourage you to create a Dynamic Subgroup that includes the leaders who are required to have Youth Protection Training. 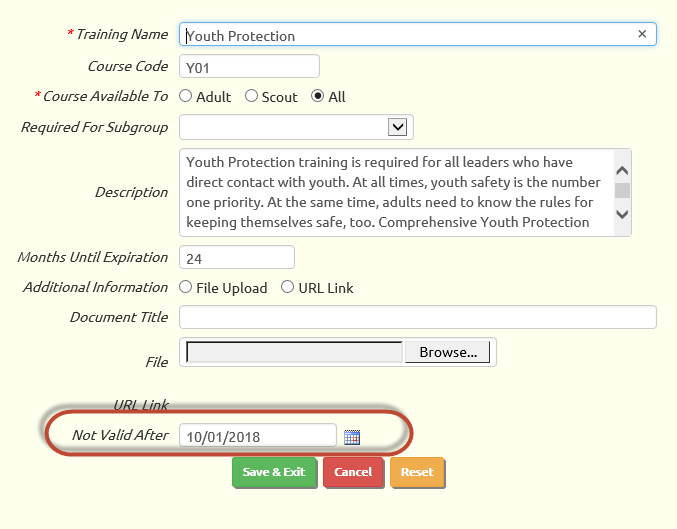 Then update the new "Youth Protection Training 2" course to select this new group from the Required For Subgroup drop down list. You can then run the Required Training By Course report to track the completion of this new course by all of the leaders for whom it is required. If you had already set up a dynamic subgroup to be required for the old version of YPT, our script copied that subgroup to the new version. The calendar page now has a link at the top that will take you back to the current month. This only displays when you are not already on the current month. TroopWebHost has always had a New Scout Registration page that made it easy to enter new scouts and their parents into the system from a single form. A version of this page is now available in TroopWebHostCS and TroopWebHostGS. When you go to Membership → Active Members you will now see an Add New Scout button at the top of the page. This will take you to a form in which you can enter your new scout and his/her parents. If a parent is already in the system, you may select them from a drop down list so that your new scout will be linked to them. Later this year the BSA plans to release "Scoutbook Lite" as a replacement for the Internet Advancement page. Scoutbook Lite will have the ability to upload advancement data from a CSV file, similar to the way Internet Advancement works today. 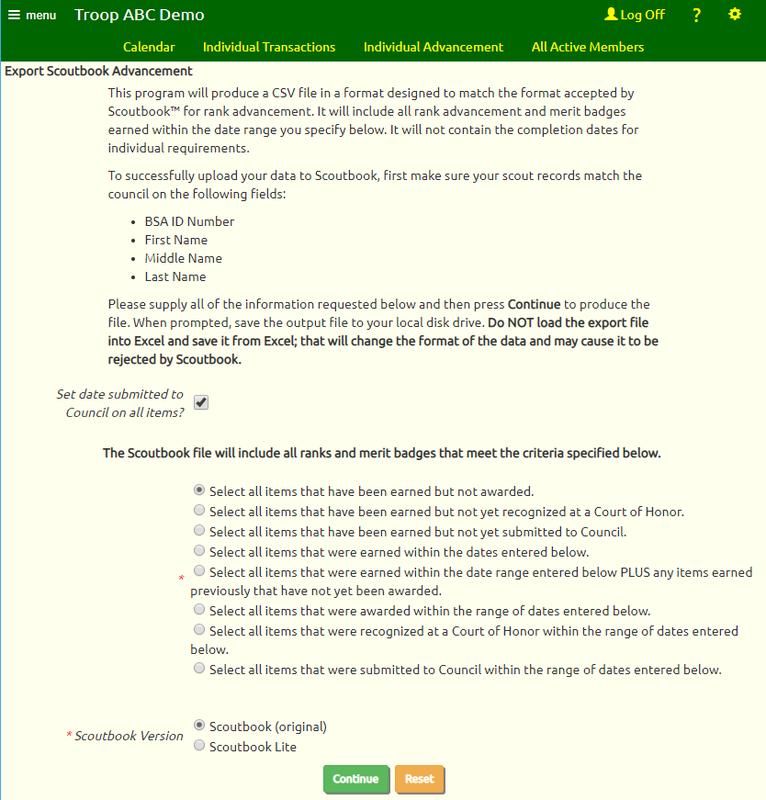 The existing Scoutbook program already has the ability to upload advancement data from a CSV file. So, in preparation for this change, we added the ability to produce a Scoutbook-compatible advancement file. This function will be revised as needed to support Scoutbook Lite™ once the specifications are released for that product. This export function is available from Advancement → Recognize Recent Achievements → Export Scoutbook Advancement.